In this world where everything is fast paced and competitive, one can feel a little overwhelmed. They can feel lost in the crowd. They can feel like they are drowning in their inability to measure up to society’s expectations and standards. It is not easy. It is not ideal but it is what it is. There is nothing more to do than equip the future generations with the skills to ignore all the news. The wherewithal to see the standards but not bend to them. The ability to understand that the only standards worth measuring up to are ones set by one’s own self. Mary Lynne Fernandez, with her extensive experience and brilliance, seeks to do exactly that with this book. She seeks to guide teenagers through life. To arm parents with tools to efficiently and successfully navigate the mucky and turbulent waters that is parenting to teenagers. She seeks to shine a light on this depression and suicide epidemic. She seeks to weed it out. She seeks to ensure teenagers seek help before they seek the noose. The only way to achieve this is by harnessing one’s own true power. To embrace and overcome. Suicide is not the way out. Staying alive to fight and exorcise those demons is. The author has done an excellent job of appealing to her demographic. She does not tell the reader to just get over it. She outlines practical steps with passion and affection. Her delivery and presentation are powerful. She lays a strong foundation for her message with vivid writing that uses simple but powerful language. She is not looking to provide answers but rather a road-map to realization. The subject matter is relevant, relatable, and rings true. She has addressed the conversation in a sensible and sober way. I think this book is aimed at two demographics. The first is the teenagers, of course. They need to understand just how stacked the deck is and how to play the game. They need to understand the truth about the world they live in. Parents of said teenagers will also find this book useful. The author does a good job of addressing both generations. 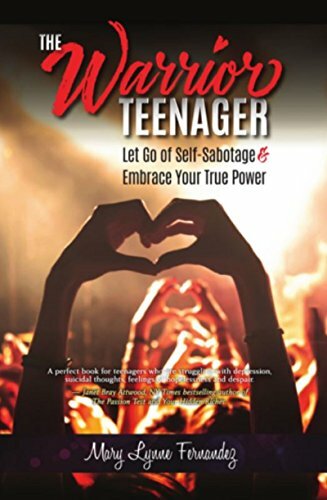 I felt that she understood and appreciated the different situations and thus successfully speaks to both parent and teen. This book is inspirational and useful by providing ingenious insights that are both practical and applicable. If you go into the woods, you may bring a wilderness survival book. If you’re becoming a teenager you may want to take this book along with you. This book will help you approach your thoughts and passions with fresh eyes. Read it. Understand it. Utilize it.